This show was broadcast on February 11, 2016. 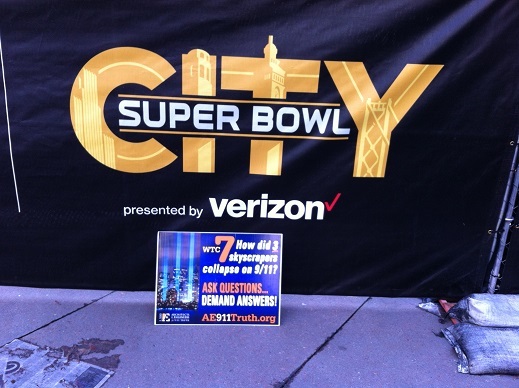 Host Andy Steele fills us in on the AE911Truth street action he and other activists did outside the NFL’s “Super Bowl City” in San Francisco during the weekend of the world’s most-watched football game (we’re talking American football, not soccer!). He also ticks off volunteer opportunities at AE911Truth and talks up a free app that helps activists share the 9/11 controlled demolition evidence. This entry was posted on Wednesday, February 10th, 2016 at 10:15 pm	and is filed under 9/11, 911 Free Fall, Anti-War, Censorship-Propaganda, Education, False Flag/Fake Terror, Freedom, Justice, News, Protest. You can follow any responses to this entry through the RSS 2.0 feed.